Since more than half of DS DS3 drivers are women it should come as no surprise that a fabulous new limited special edition comes courtesy of Givenchy. DS says the new car will meet the expectations of today’s modern women who are ‘always on the go’. 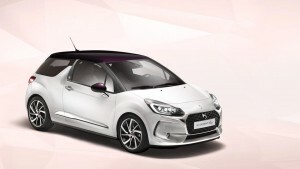 Available to order from 1 June, the DS3 Givenchy Le MakeUp will be a limited edition in cabrio or hatchback guises with the firm’s excellent three cylinder PureTech 110 petrol engine under the bonnet. However, there will be just 500 of this special edition car made for the UK which also feature a Givenchy make-up kit which is stored in a compartment in the driver’s armrest – DS say the driver and passenger can check or apply their make-up before driving in the car’s spacious interior. It helps that the DS DS3 has special LED courtesy interior lights which have been developed specially for this car and will produce the best illumination possible whether it’s day or night. The appeal to women drivers is underlined by the striking ‘Rose Pink’ dashboard which is set against the interior’s premium black leather upholstery. This model also features a new paint process which is being used for the first time by any carmaker in the world which delivers a granular feel and a nice matte finish to highlight the car’s lines. The equipment list for the DS3 Givenchy Le MakeUp model is quite long with a 7-inch touchscreen, rear parking sensors, hill start assist, 17-inch black alloy wheels and matching black leather steering wheel, gear knob, handbrake and instrument binnacle among the kit available. There’s also an auto pack which includes automatic headlights, folding door mirrors and air con. For those who need to know, the cosmetics kit is also quite extensive and the price for the new DS DS3 start at £19,395 for the hatchback version and £21,695 for the cabrio. This entry was posted in Car Leasing, Cars, Popular Cars, Small Car and tagged DS DS3 by Steve Lumley. Bookmark the permalink.